Wednesday, Feb. 27, 7:00pm will be last meeting for the Let’s Talk About It book discussion. We will be discussing: W;t by Margaret Edson. Please remember to return all of your books borrowed from the Maine Humanities Council by this date. 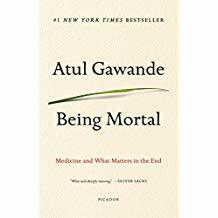 If you requested to join the Wednesday, March 27 book discussion of Being Mortal : Medicine and What Matters in the End by Atul Gawande, you can pick up the book at or after the Feb. 27th meeting. Please note this is not part of the series provided by the Maine Humanities Council. The library is doing this one independently. Let’s Talk About It is a group for people who want to talk about books. The books and facilitator, John Zavodny, will be provided by the Maine Humanities Council in collaboration with the Maine State Library. We will meet Wednesdays for five sessions. All sessions will begin at 7:00pm at the library for approximately 90 minutes. Exploring Human Boundaries: Literary Perspectives on Health Care Providers and Their Patients. A disease or a sick person? Health care professionals do not always focus on what is most important to the patient and the patient’s family. These classic 20th-century accounts of illness, death, and dying dramatically illuminate these complex issues.